Kovács MM. The Numerus Clausus and the Anti-Jewish Laws. In: The Holocaust in Hungary Seventy Years Later. Budapest: CEU Press; 2016. Kovács MM. The Numerus Clausus in Hungary, 1920-1945. In: Rossolinski-Liebe G, Starek J, editors. Alma Mater Antisemitica. Wien: Academic Press; 2016. Kovács MM, Braham R. A numerus clausus és a zsidótörvények. In: Kovács A, Braham RL, editors. A holokauszt Magyarországon hetven év múltán. Történelem és emlékezet. Budapest: Múlt és Jövő; 2015. Kovács MM. Magyar-e a nagypapa? Magyar Nemzet Online. 2015. Kovács MM. Bethlen István és a zsidókérdés. Mozgó Világ. 2015;August. Kovács MM. A numerus clausus és a zsidótörvények. Mozgó Világ. 2014;2014(5):22-8. Kovács MM. Disenfranchised by Law, The 'Numerus Clausus' in Hungary 1920-1945. S.I.M.O.N. (Vienna) . 2014;2014/2. Kovács MM. Holocaust Gedenkjahr und Horthy-Rehabilitierung in Ungarn. Europaische Rundschau. 2014;2014/1:33-45. Kovács MM. A numerus clausus és a zsidótörvények (The numerus clausus and the anti-Jewish laws). Mozgó Világ. 2014. Kovács MM. 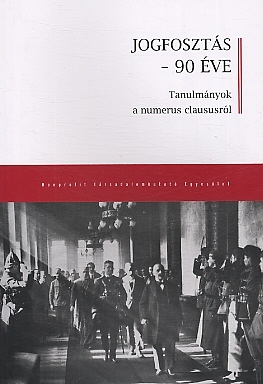 A numerus clausus törvény 1928-as módosításáról (On the modification of the numerus clausus law in 1928). In: H. BZ, T. NP, editors. .): Zsidóság – tradicionalitás és modernitás. Jubileumi kötet a 75 éves Karády Viktor tiszteletére. (Jews – traditionalism and modernity. For Victor Karady’s 75th Birthday) . Budapest: WJLF; 2013. Kovács MM. Törvénytől sújtva A numerus clausus Magyarországon 1920-1945. Budapest: Napvilág Kiadó; 2012. Kovács MM. The numerus clausus law in Hungary, 1919-1945. In: Kovács MM, Karády V, editors. The Hungarian numerus clausus law and academic anti-Semitism in interwar Central Europe in Europe. Budapest: Pasts Inc., CEU; 2011. Kovács MM. Bishop Ottokár Prohászka's advocacy of anti-Jewish legislation in interwar Hungary. In: Gwen J, editor. Transformations of Anti-Semitism in Poland and Hungary. Bergham Publishers; 2011. p. 1-100. Kovács MM. A numerus clausus törvény és következményei. In: Molnár J, editor. Számokba zárt sorsok - A numerus clausus 90 év távlatából . Budapest: Holokauszt Emlékközpont; 2011. p. 53-84. Kovács MM. Numerus clausus Magyarországon, 1919–1945. In: Molnár J, editor. Jogfosztás - 90 éve: tanulmányok a numerus claususról. Budapest: Nonprofit Társadalomkutató Egyesület; 2011. p. 29-59. 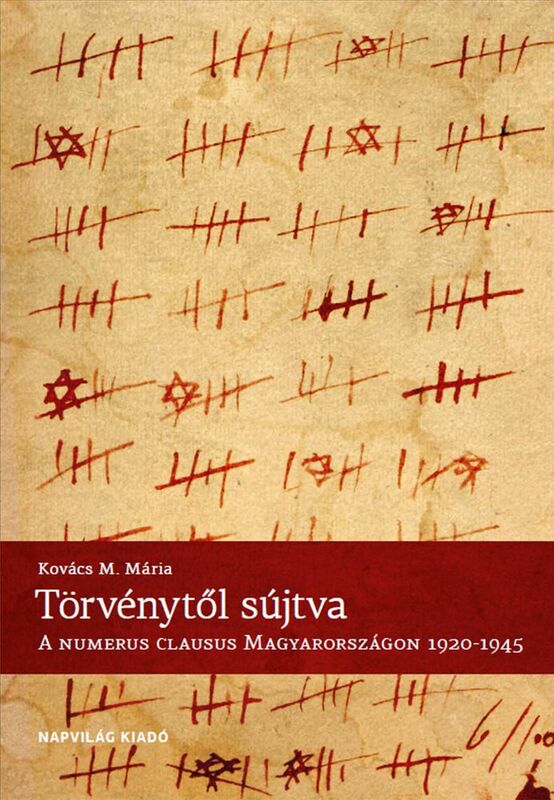 Kovács MM, Karády V. The Hungarian Numerus Clausus Law and Academic Anti-Semitism in Interwar Central Europe. Research Reports, Studies and Documents in East-Central European Social History. 2011. Kovács MM. Támadás a történelem ellen (Attack against History). 168 óra. 2011. Kovács MM. Ethnic Preferentialism in European Union States, East and West. Is there (still) an East-West Divide in the Conception of Citizensip in Europe?. 2010;2010/19:5-7. Pogonyi S, Zsolt K, Kovács MM. The Politics of External Kin-State Citizenship in East Central Europe. EUDO Citizenship. 2010. Kovács MM. Senior Academic Advisor to the exhibition on the Numerus Clausus at the Budapest Memorial Center for Holocaus, Opening 14 October, 2010. Academic advisor to the exhibition “Számokba zárt sorsok” (Destines locked in numbers) of the Holocaust Center of Bud. ; 2010. Kovács MM, Tóth J. Country Report: Hungary. EUDO Citizenship Observatory, Robert Schuman Centre for Advanced Studies in collaboration with Edinburgh University Law School; 2010. Kovács MM, Szabolcs P, Zsolt K. The Politics of External Kin-State Citizenship in East Central Europe. EUDO Citizenship Observatory, Robert Schuman Centre for Advanced Studies in collaboration with Edinburgh University Law Schoo; 2010. Kovács MM, Tóth J. Kin-state responsibility and ethnic citizenship : The Hungarian case. In: Bauböck R, Perchinig B, Sievers W, editors. Citizenship policies in the new Europe. Amsterdam: Amsterdam University Press; 2009. p. 151-75. (IMISCOE research). Kovács MM. Prohászka Ottokár és a zsidótörvények. Prohászka és Kovács Alajos nézeteinek összefüggéséről (Ottokar Prohaszka and the anti-Jewish laws: on the connections between Prohászka and Alajos Kovács). In: A ZSIDÓSÁG PROHÁSZKA OTTOKÁR ÉLETMŰVÉBEN - TUDOMÁNYOS KONFERENCIA. WJLF, Teológus és Lelkész Szak, Ökumenika Tanszék; 2009. Kovács MM, Tóth J. Kin-state responsibility and ethnic citizenship. The Hungarian case. Acquisition and Loss of Nationality, Expanded and Revised Edition. 2009;Volume 1. Kovács MM. A jobboldal és a numerus clausus (The Political Right and the Numerus Clausus). Élet és Irodalom. 2009;LIII/42. Kovács MM. Szavak és tettek: Prohászka Ottokár, a numerus clausus és a zsidó törvények (Speech and Action, Ottokár Prohászka, the Numerus Clausus and the anti-Jewish Laws). Élet és Irodalom. 2009;LIII/25. Kovács MM. A kettős állampolgárság csapdája” (The trap of dual citizenship),. Élet és Irodalom. 2008;LII/48. Kovács MM, Tóth J. Kin-state responsibility and ethnic citizenship : the Hungarian case. In: Bauböck R, Perchinig B, Sievers W, editors. Citizenship policies in the new Europe. Amsterdam: Amsterdam University Press; 2007. p. 135-59. (IMISCOE research). Kovács MM. The Politics of Dual Citizenship in Hungary: Lessons of a Failed Referendum. In: Faist T, Kivisto P, editors. Dual Citizenship in Global Perspective, From Unitary to Multiple Citizenship. New York: Palgrave-Macmillan; 2007. p. 92-112. Kovács MM. The Politics of Dual Citizenship in Hungary. Faist T, Kivisto P, editors. New York: Palgrave Macmillan; 2007. Kovács MM. The Case of the Teleki Statue : New Debates on the History of the Numerus Clausus in Hungary. In: Kovács A, Miller M, editors. Jewish Studies at the Central European University, 2003-2005. Vol 4. Budapest: Central European University. Jewish Studies Program; 2006. p. 191-208. (Jewish Studies at the CEU; vol 4). Kovács MM. The Politics of Dual Citizenship in Hungary. Citizenship Studies. 2006;10(4):431-51. The study reviews the politics underlying the 2004 referendum in Hungary on whether the country should offer extraterritorial, non-resident citizenship to ethnic Hungarians living in the neighboring states of Romania, Slovakia, Serbia-Montenegro and the Ukraine. The study argues that the issue of dual citizenship for ethnic minorities and kin-states in Central and Eastern Europe is quite distinct from the issue of dual citizenship in West European immigration countries. Transborder ethnic relatives make up large proportions of some of the contiguous countries with whom Hungary has a long history of border disputes which is why the Hungarian reform initiative touched upon sensitive issues connected to the sovereignty of these states. In addition, the large size of the non-resident Hungarian population means that their potential Hungarian citizenship would have serious consequences for the Hungarian welfare state, and the determination of the political future of Hungary, where even much smaller numbers of voting non-residents might swing the vote. The article outlines the arguments that were made in favor of the reform by the political right and those against the reform by the left. It examines the initiative from the European Union's perspective and compares the Hungarian case to cases of dual citizenship in other countries of Europe. The article also raises questions about the long-term implications of this form of dual citizenship for the “re-ethnicization” of citizenship. Kovács MM. The Ambiguities of External Minority Protection : The Hungarian Numerus Clausus Debate. East European Jewish Affairs. 2006;36(1):43-8. Kovács MM. A numerus clausus és a zsidótörvények összefüggéséről. In: Molnár J, editor. A holokauszt Magyarországon európai perspektívában. Budapest: Balassi kiadó; 2005. p. 128-39. Kovács MM. A nemzeti kisebbségek védelmének eszközei az Európai Unióban a 2004-es bővítés után. In: Tamás P, Erőss G, Tibori T, editors. Kisebbség – többség. Vol 1. Budapest: Új Mandátum; 2005. p. 90-5. 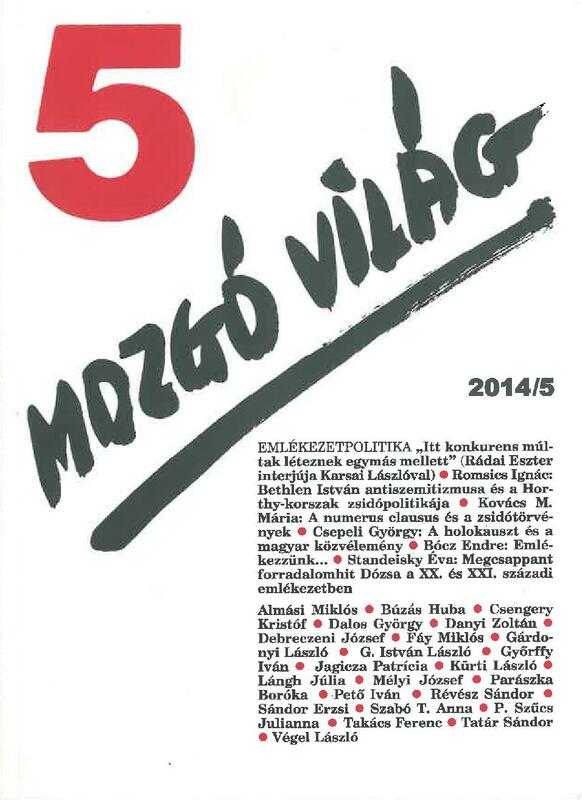 (Nemzetfelfogások; vol 1). Kovács MM. The Problem of Continuity between the 1920 Numerus Clausus and Post-1938 Anti-Jewish Legislation in Hungary. East European Jewish Affairs. 2005;35(1):23-32. Kovács MM. The Politics of Non-resident Dual Citizenship in Hungary. Regio : Minorities, Politics, Society. 2005;(1):50-72. The idea of dual citizenship emerged in Hungary with reference to a larger international process of the increasing use and tolerance of dual citizenship, partly within the European Union and partly within the East-Central European region. However, while in the major immigration states of Europe dual citizenship has been espoused above all by the political left as an instrument of integrating labour migrants, in Hungary, as in many other states of the region, the demand for dual citizenship has mostly, if not exclusively emanated from the political right and is predominantly directed at trans-border ethnic relatives. The novel aspect of the proposal was not the introduction of dual citizenship itself, since the option of obtaining a Hungarian second citizenship had long been available for permanent residents within the country. The innovation would have been to remove all residency requirements from among the pre-conditions of obtaining a Hungarian second citizenship.In the Hungarian referendum debate, the battle over dual citizenship has been cast as a debate between the nationalist right, as supporters, on the one hand, and the Europe oriented liberals, as opponents, on the other. Neither side in the Hungarian debate was able to present a coherent interpretation of those principles and international norms and practices that would support their respective positions. In the final analysis, it is quite possible that the conflicting stances of the left and the right will stem from concerns that are only vaguely connected to the problems of trans-border Hungarians. Studies on nationalism from CEU. Kovács MM, Lom P, editors. Budapest: Central European University. Nationalism Studies Program; 2004. Kovács A. NATO and Hungarian Public Opinion. In: Kovács MM, Lom P, editors. Studies on nationalism from CEU. Budapest: Central European University. Nationalism Studies Program; 2004. p. 149-69. Kovács MM. Standards of self-determination and standards of minority-rights in the post-Soviet era : a historical perspective. In: Kovács MM, Lom P, editors. Studies on nationalism from CEU. Budapest: Central European University. Nationalism Studies Program; 2004. p. 43-59. Várady T. Chances for ideas in a post-dissident intellectual environment. In: Kovács MM, Lom P, editors. Studies on nationalism from CEU. Budapest: Central European University. Nationalism Studies Program; 2004. p. 171-6. Kovács MM. Egy tanulságos párhuzam.. 2004. Kovács MM. Hungary. In: Passmore K, editor. Women, gender, and fascism in Europe, 1919-45. Manchester: Manchester University Press; 2003. p. 79-90. Kovács MM. Standards of self-determination and standards of minority-rights in the post-communist era : a historical perspective. Nations and Nationalism. 2003;9(3):433-50. Kovács MM. Aesculapius militans. In: Gyáni G, editor. Magyarország társadalomtörténete : 1920-1944. Vol 2. Budapest: Nemzeti Tankönyvkiadó; 2000. p. 493-507. Kovács MM. Ügyvédi és orvosi politika a zsidótörvények idején. Mozgó világ. 1998;24(1):107-20. Kovács MM. Nemzeti önrendelkezés és politikai szabadság. Világosság. 1998;39(2):67-72. Kovács MM. A kisebbségek nemzetközi jogvédelmének politikai csapdája. In: Braham RL, Pók A, editors. The Holocaust in Hungary : fifty years later. Vol 477. New York: Rosenthal Institute for Holocaust Studies; 1997. p. 137-45. (East European monographs; vol 477). Kovács MM. A nemzeti önrendelkezés csapdája. Rubicon. 1997;(2):20-3. Kovács MM. Ambiguities of Emancipation : Women and the Ethnic Question in Hungary. Women's History Review. 1996;5(4):487-95. Examines the ambiguous nature of women's political emancipation in Hungary & its relationship to ethnic issues. The liberation of women occurred during a time of great ethnic & social fragmentation of Hungarian society, shortly after the turn of the century. When the demand for women's suffrage became public, a large proportion of these vocal women were of ethnic minority groups. Women's suffrage thus became connected to the suffrage of minorities. Although women were given the vote in 1920, restrictions were placed on the attendance of women & Jews in public institutions. It is concluded that, for Hungarian feminism to survive under such conditions, it had to ignore many of the gender concerns associated with Western feminism; there was a destructive component to women's emancipation in Hungary. Adapted from the source document. Kovács MM. Aesculapius militans. In: Gyáni G, editor. Magyarország társadalomtörténete : 1920-1944. Vol 2. Budapest: Nemzeti Tankönyvkiadó; 1995. p. 493-508. (Történeti szociológiai könyvtár; vol 2). Kovács MM. The Radical Right and the Hungarian Professions : The Case of Doctors and Lawyers, 1918-1945. In: McClelland C, Merl S, Siegrist H, editors. Professionen im modernen Osteuropa. Vol 207. Berlin: Duncker & Humblot; 1995. p. 168-88. (Osteuropastudien der Hochschulen des Landes Hessen : Reihe I; vol 207). Kovács MM. A kisebbségek nemzetközi jogvédelmének politikai csapdája. In: Kőszeg F, editor. Vázsonyi Vilmos emlékezete : konferencia Vázsonyi Vilmos életművéről. Budapest: AB-Beszélő; 1995. p. 31-8. Kovács MM. A numerus clausus és az orvosi antiszemitizmus a húszas években. Budapesti negyed. 1995;3(2):137-58. Kovács MM. Liberal professions and illiberal politics : Hungary from the Habsburgs to the Holocaust. Washington, D.C.: Oxford University Press; 1994. Kovács MM. A kisebbségek nemzetközi jogvédelmének politikai csapdája : Vázsonyi Vilmos és a numerus clausus. Beszélő. 1994;5(14):28-30. Kovács MM. A magyar feminizmus korszakfordulója. Café Bábel. 1994;4(11-12):179-84. Kovács MM. Book review : Ethnicity and Citizenship. ; 1994. This article reviews the book "Citizenship and nationhood in France and Germany" by Rogers Brubaker. Kovács MM. Book review : Citizenship and Nationhood in France and Germany. ; 1994. Kovács MM. Book review : The unfree professions : German lawyers, teachers, and engineers, 1900-1950.; 1993. This article reviews the books "The unfree professions : German lawyers, teachers, and engineers, 1900-1950" by Konrad Hugo Jarausch and "The German experience of professionalization : modern learned professions and their organizations from the early nineteenth century to the Hitler era" by Charles E. McClelland. Zsidóság, identitás, történelem. Kovács MM, Kashti YM, Erős F, editors. Budapest: T.-Twins Kiadó; 1992. Kovács A. Identitás és etnicitás : Zsidó identitásproblémák a háború utáni Magyarországon. In: Kovács MM, Y.M. K, Erős M, editors. Zsidóság, identitás, történelem. Budapest: T-Twins; 1992. p. 97-113. Kovács MM. Interwar antisemitism in the professions : the case of the engineers. In: Silber MK, editor. Jews in the Hungarian economy, 1760-1945 : studies dedicated to Moshe Carmilly-Weinberger on his eightieth birthday. Jerusalem: Magnes Press; 1992. p. 237-44. Kovács MM. Zsidók és magyarok – a rendszerváltás után. In: Kovács MM, Kashti YM, Erős F, editors. Zsidóság, identitás, történelem. Budapest: T.-Twins Kiadó; 1992. p. 49-58. Kovács MM. Jews and Hungarians : A View after the Transition. Washington, DC: Woodrow Wilson International Center for Scholars; 1992. Kovács MM, Örkény A. Szociológiai füzetek. Vol 52. Budapest: ELTE Szociológiai és Szociálpolotikai Int. és Továbbképző Központ; 1991. Kovács MM. Hányadik gabonaszem? Maier és a német történészviták. Buksz. 1991;3(3):340-3. Kovács MM. The Ideology of Illiberalism in the Professions : Leftist and Rightist Radicalism among Hungarian Doctors, Lawyers and Engineers, 1918-45. European History Quarterly. 1991;21(2):185-207. In the interwar period, Hungary's academic professions were transformed from a politically liberal & professionally orientated elite into an illiberal pressure group attracted to radical politics. Here, based on research in the archives of the Hungarian Chamber of Doctors, the Chamber of Engineers, & the Chamber of Lawyers, the special organizational & economic logic behind the radicalization of the professions is considered, with attention to the Jewish question, which inevitably played a role since 50+% of all lawyers & doctors (MDs) in Hungary at that time were Jews. The organizational segregation of Jewish professionals in the interwar period preceded the introduction of the anti-Jewish laws of 1938/39 that banned Jewish applicants from the professions. Later, after the German occupation of Hungary in Mar 1944, lists of Jewish MDs were directly handed over to the Nazis by the leadership of the Chamber of Doctors to ensure the quick & efficient deportation of Jewish MDs from the country in the months of the Hungarian Holocaust. The political behavior of the engineering & medical professions, both in the forefront of illiberal movements, is compared to that of the legal profession, which, at least in terms of its corporate policies, resisted joining forces with illiberal movements & governments. Kovács MM. Hungary. Partisan review. 1991;58(4):665-9. Kovács MM. Liberalizmus és szakértelmiség. Világosság. 1991;32(6):426-33. Kovács MM. Book review : How the East Was Won. ; 1991. This article reviews the book "We the people : the revolution of '89 witnessed in Warsaw, Budapest, Berlin & Prague" by Timothy Garton Ash. Kovács MM. Lawyers against the current anti-Semitism and liberal response in interwar Hungary. In: Don Y, Karády V, editors. A social and economic history of Central European Jewry. New Brunswick: Transaction Publishers; 1990. p. 249-56. Kovács MM. Hungarian women entering the professions : feminist pressures from left to right. In: Karády V, Mitter W, editors. Bildungswesen und Sozialstruktur in Mitteleuropa im 19. und 20. Jahrhundert. Vol 42. Köln: Böhlau; 1990. p. 247-57. (Studien und Dokumentationen zur vergleichenden Bildungsforschung; vol 42). Kovács MM. Book review : Forradalom náthával?. ; 1990. Book review : Forradalom náthával? This article reviews the book "We the people : The Revolution of ’89 witnessed in Warsaw, Budapest, Berlin and Prague" by Timothy Garton Ash. Jeszenszky G, Kovács MM, Deák I. 'Hungary's New Twist' : An Exchange. New York Review Of Books. 1988;35(18):46-7. Kovács MM. Official Anti-Semitism and Professional Associations in Interwar Hungary. Danubian Historical Studies. 1987;1(2):47-54. Kovács MM, Varga L. A magyarországi zsidóság gazdaságtörténetéről. Történelmi szemle. 1987;30(3):249-55. Kovács MM, Örkény A. Promoted cadres and professionals in post-war Hungary. In: Andorka R, Bertalan L, editors. Economy and society in Hungary. Vol 3. Budapest: Karl Marx University of Economic Sciences, Department of Sociology; 1986. p. 139-52. (Hungarian sociological studies; vol 3). Kovács MM. Luttes professionelles et antisemitisme : chronique de la montee du fascisme dans le corps medical hongrois 1920-1944. Actes de la recherche en sciences sociales. 1985;56:31-44. Occupational Struggles and Anti-Semitism : Chronicle of the Rise of Fascism in the Hungarian Medical Corps, 1920-1944The rise of anti-Semitism in the 1930s in Hungary was accompanied in medical circles by intensified competition between Jewish & non-Jewish MDs for the most lucrative sectors of the health market, & by increasingly firm state intervention to regulate this market (particularly by developing health insurance schemes). The corporatist-style MDs' federations, set up by the state in 1936 to counterbalance the growing influence of the right-wing MDs, were sites of confrontation between the pro-fascist & liberal sections of the medical corps. Even after the anti-Jewish legislation of 1938 & 1939 (which limited the proportion of Jewish MDs in the federations to first 20% & then 6%), the government continued to resist anti-Semitic extremism & applied the repressive laws in a liberal way so as to prevent disorganization of the public health service. The German invasion in Mar 1944 brought this liberal policy to an end, replacing it with the "final solution". Kovács MM. Ügyvédek az árral szemben : Antiszemitizmus és liberális ellenállás a Horthy-korszakban. Medvetánc. 1985;5(2-3):91-7. Kovács MM. Aesculapius militans : érdekvédelem és politikai radikalizmus az orvosok körében : 1919-1945. Valóság. 1985;28(8):69-82. Kovács MM. Közalkalmazottak, 1938-1949 : létszám, összetétel, politika. Valóság. 1982;25(9):41-53. Kovács MM, Örkény A. Szakérettségisek. Mozgó világ. 1981;7(5):102-9.